Did you get the calendar alert? It's a pretty important one, considering what day it is. And because you've been looking forward to it so much. And it's here. It's monkey day! Of course, any old day can be monkey day. When you have this Monkey Adult Accessory Kit! You can transform a regular outfit into a monkey costume when you use this ears and tail combo set to add signature monkey styling. For a quick, easy, and cute costume, this set can't be beat! 100 percent polyester fabric and faux fur, the two-piece set also has 100 percent polyurethane foam details. 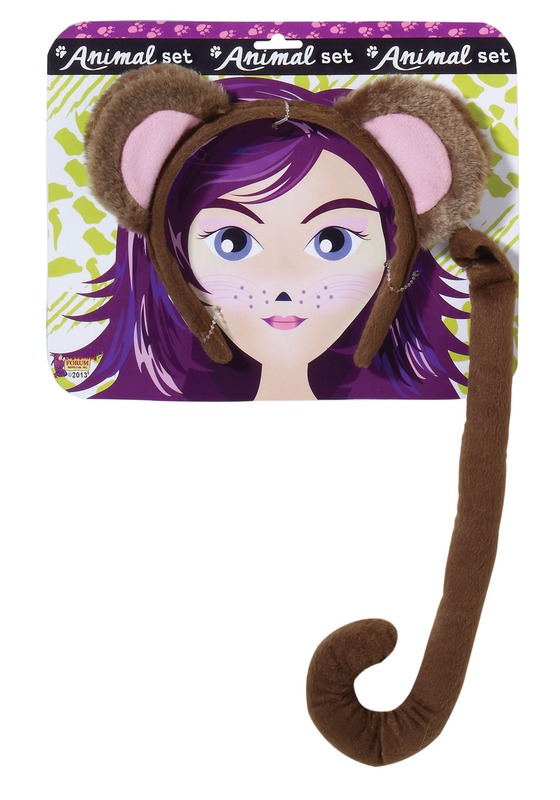 Faux fur ears are sewn to the fabric-covered plastic headband. The stuffed tail just needs a safety pin to attach it to your outfit (pin not included). It's sized to fit most teen and adult women. We're sure you'll be perfectly pretty primate when you pop on this accessory set. Style your hair just right, and put the headband on. A little makeup might enhance the effect, but that's totally optional! Just coordinate the rest of your outfit, and attach the tail on your backside with a pin. You'll be monkey-riffic in no time!